The AquaClear Power Filter is one of the best aquarium filters available due to its special ability to increase or decrease the contact with the water depending on the users’ preference. It will also depend on the flow rates of the tank how long the water comes in contact with the filter media. The best part is that this aquarium filter has the longest water to filter media contact as compared to its competitors in the industry today. This is a big advantage for users considering its price and value-added features. It is designed to reduce the space needed for canister filters as it is a hang-on system that could be put at the top of the aquarium. It provides a variety of flow rate options that can accommodate the most popular aquarium sizes. The flow control allows the users to lessen the flow in the tank by up to 50 percent without any harm on the motors of the filter machine. Slower flow rate means longer time for the water to be in contact with its filter media, which can ultimately add to the water quality. This is what the AquaClear Power Filter is so special about, though that’s not all it can offer. The product comes with a small box. It’s easy and quick to install because of the minimal parts. Some people wouldn’t even need instructions when they’re already used to assembling filters. Moreover, some parts will fit right through each other like a mini jigsaw puzzle. When you open the box, there will be another carton box inside. It contains the filter media inserts such as a coarse sponge, carbon filters, some bio-media filters, a plastic mesh bag and a clip. Beside that carton box, you should see the user manual which contains the installation instructions, precautions, and the maintenance process. At the bottom of the box, you will find the filter case. At the top of the filter case is the lid. Attached to it is the media tray. Inside, you can get the U-tube and the two in-pick strainers that you should put on together. The media tray is where you should stack the media filters. You must get the sponge first and put it at the bottom. The carbon is next and finally the bio-media. Enclose the bio-media with the plastic mesh bag using the clip. Put it back in the filter case. Put the connected U-tube and two in-picks at the side where it can obviously fit in. You will a protruding valve at the top of the U-tube – that’s the flow control. The flow control will also serve as a guide on how you will put the lid back at the top. Finally, hang the filter on the aquarium. Most users prefer to put it at the back but you can also put it at either side of the tank. The very first thing this aquarium filter can brag about is its ability to have a longer time in contact with the water as compared to other ordinary filters. This means that the filtration system has more time to clean and eliminate the unwanted substances in the water, adding to the quality and beauty of the tank water. Thanks to the re-filtration System of the AquaClear Power Filter, it allows you to control the flow rate of the water. It does not only lengthen the contact of the water with the filter media but also helps to balance the flow for the fishes and plants in the small ecosystem. This is very important because some fishes and plants can’t handle strong water flows or tend to be sensitive with lesser flow. The right amount of flow rate is crucial and you can control it using this versatile filter. 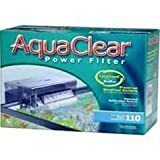 The AquaClear Power Filter also uses the Cycle Guard System which fulfills all the filtration needs of every aquarium. Because of its three different filter media, it supports a healthier environment in the small marine ecosystem. It has the capability to grow beneficial bacterial colony in the tank because of its biological filter or BioMax. The coarse sponge helps to clean impurities in the tank such as the small and large debris. The chemical filter or the activated carbon, on the other hand, keeps the tanks safe for fishes and other marine life because it filters harmful substances and pollutant in the water. The most common problems in aquariums causing the fishes to die suddenly, toxic ammonia and nitrite, are also eliminated because of the bio and chemical filters. Because the AquaClear Filter does not use a cartridge system where it is removed when cleaning the filter media, the aquarium is kept healthy. This is because beneficial bacterial colonies are not lost. Only one of the three filter components is removed during maintenance. This will ensure that the right amount of beneficial bacteria still remains in the tank. Creates vibration sounds at first. Not as compact compared to other filters. The AquaClear Power Filter is for everyone who’s is looking for an aquarium filter that can similarly perform like large aquarium filters. Although it has small filter components comprising only of a sponge, activated carbon, and some bio-media, the re-filtration system and flow control of the AquaClear Power Filter offsets that inadequacy. It can deliver a superior performance because of its unique filtration system being similar to a canister filter. Considering its very cheap price and energy-efficient pumps, it is definitely a win-win situation for every aquarium owners. The bonus part is the easier and quicker installation process. This means that the maintenance will also be easier because only one part of the filtering component should be removed and cleaned from time to time, as compared to the filters with the cartridge system. To sum it up, the AquaClear Power Filter is the filter that aquarium owners should pick when they’re looking for economical filters that can last for a decade or more. I've been introduced to fishkeeping as a child and explored deeper into the hobby after high school. 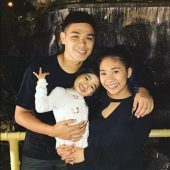 I've been in the hobby for 5 years and counting. How Much Gravel For an Aquarium?